I'm looking at famous serial killer movies this week as I celebrate the 20th anniversary of Silence of the Lambs. 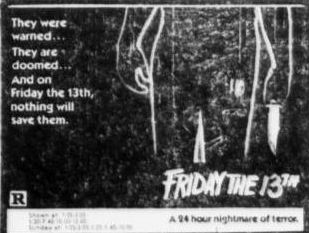 Here is an ad for the first Friday the 13th. Jason Vorhees debuted as a child in this movie. However, the killer as we know him later didn't actually come about until Part 2 (sack over head Jason) or Part 3 (hockey mask Jason).